NOTE: Sorry for posting this a bit late. The only excuse I’ve got is that I was busy at the movie theater doing more research for this blog post (honest!). Despite the fact that the comic book industry bemoans its sad state on average once every nanosecond (more frequently than the book industry, believe it or not! ), they must be doing something right if mass market narratives like Marvel’s The Avengers can just elide backstory, origins, or explanations and expect audiences to accept their characters as given. Captain America, Iron Man, Thor, the Hulk, Superman, Batman, Spider-man (note the sustained and sad preponderance of the male adjective in there) have become so integrated into Western culture that their mythos are omnipresent. But why? Why do we love super heroes and why – after two decades in the weeds – are super heroes flying off movie screens and DVD racks? There are a great many different kinds of comic books, from the spandex-clad super heroes we think of by default, to fictional slice-of-life stories, to crazy experiments in form and narrative. For the purposes of this discussion, I’m going to focus on the super hero genre – the others operate within entirely different conventions. Let me start with a disclaimer: My name is Chris, and I am a lapsed comic book reader. As a kid, I must’ve spent a small fortune in birthday and couch cushion money at my local comic book shop. Every X-book, all the Spider-man books, the Batman line, Superman, Image’s early stuff, Alan Moore, Frank Miller, etc. etc. The list of books I inhaled uncritically is kind of embarrassing (and my bagged and boarded long boxes are still taking up space in my parents’ basement more than a decade after I moved out). It wasn’t until I got a lot older (and abandoned the super hero genre due to the fact that it generally did not and does not care about quality writing) that I started to really think about why certain comics appealed to me more than others. Like any fictional conceit, super heroes are concretized metaphors. This applies just as much to Superman as it does to the X-Men. Only some metaphors are more transparent than others. It doesn’t take a doctorate in semiotics to label the archetypes that some characters represent: Superman, Batman, the Hulk, Captain America, Daredevil are idealized symbols for our collective imagination. These characters embody a particular ethos, and we enjoy their stories because they allow us to vicariously partake of a Nietzschian ideal. Other heroes – Moore’s Watchmen, Spider-man, the X-Men, or the Fantastic Four – do not so much embody an archetype as provide a lens to examine its aspirational application. Through Peter Parker’s struggle to balance his heroic aspirations against his family life, we can examine what happens when one strives towards the archetype in a more realistic world. At their core, this is what gives certain super heroes staying power within our culture. And story arcs that tap into this core are those that will resonate and stay with us. But that is the deeper, unspoken truth about comics and about super heroes. It speaks to our psychology as an audience, and to the creators’ philosophy as artists. But identification and concretized metaphor does not explain why audiences shelled out over $300 million to see spandex-clad divas smack each other around. The answer lies in a dirty word: escapism. That’s right. I said the e-word. I think of it as dirty because it is how “serious fiction” sidelined speculative fiction for decades. But escapism is a powerful narrative tool. It is a release valve for societies, and it is one that Marvel’s The Avengers employs flawlessly. Regardless of whether it is in sequential art or film, ensemble narratives like The Avengers, or the Justice League, or the X-Men cannot possibly focus on their characters’ underlying archetypes: there are too many characters playing upon too many archetypes for that kind of narrative to hold together (despite the industry’s love of over-played crossover arcs). Instead, they tap into the audience’s yearning for entertainment and the abrogation of responsibility. As human beings we like to have someone else do the work. We work hard all day long, we are stressed, we take tough phone calls, and we have difficult conversations. Most of us don’t need to fight giant robots or aliens or monsters, but we all struggle anyway. And there is something cathartic about watching someone else do the struggling for a little while. This is the same desire that makes us appreciate eucatastrophe in fiction when executed well. I’ve mentioned before that I don’t much like (or really believe in) eucatastrophe as a narrative device, but when done well it is satisfying for the same reason: it places the hard choices on someone else, someone “extraordinary” with whom we can never wholly identify. Ensemble super hero narratives rely on Othered saviors rescuing us from Othered villains. Though in a more focused narrative the villains might well play archetypal roles, they are simply external threats which we (collectively) are not responsible for. Sure, Magneto is responding to anti-mutant bigotry. But we, the enlightened audience, are never responsible for that: we like the mutants…or why would we buy their books? And Lex Luthor might be a product of capitalist laissez-faire society, but hey…he’s one egomaniacial super-genius. And Loki…well, he’s a demi-god, an alien, and crazy to boot. And lest we forget, if something goes wrong in comic book land you can bet the Government (or its sunglass-wearing agents) had a hand in it somewhere. Ensemble super hero narratives are summer blockbusters, meant to briefly entertain, not change the world. And they do so by presenting us with problems that are not ours, and then parachuting someone else in to fix them. Why are they resurgent now? Yes, yes, I know that comic books as a medium are struggling for a host of economic reasons. And while I personally think that’s because it is hard to grow an audience solely by focusing on art with scant attention to writing, it is fair to say that the super hero genre is doing better today than it ever has. Could a movie like The Avengers have been as successful twenty years ago? No. Because we as society were not in the mood for it then. Today, that kind of escapism is in the air. It is something we need. Thirty years ago, Moore’s Watchmen showed us that heroes and villains need not be archetypal or aspirational. That they can be flawed, and human, and with all of the ugliness and beauty that entails. What followed was three decades of increasing grit, and darkness, and hard-edges…perhaps a counter-reaction to the Cold War’s end and the ensuing economic, technological, and social boomtimes of the ’90s. But today is a very different world, beset by very different problems – environmental, political, social, economical, and diplomatic. And over the course of the last decade, it seems to me that the super hero pendulum has been swinging back in the direction of greater escapism: to offer a soothing balm to the challenges of our real world. In real life, there are no heroes able to step up and deal with these very real problems on our behalf. And when – as these days – we see our leaders failing to do so, when we see our neighbors failing to do so, and when we see ourselves failing to do so, it is only natural that we should fantasize about a group of different people, with different backgrounds, different beliefs, and different skills doing the impossible. In the United States, at least, we mythologize our cultural heroes. Whether it is the revolutionary militias camped at Valley Forge, the Founding Fathers in a hot Philadelphia State House, the pioneer settlers pushing west, or the Greatest Generation, we expect someone in our society to step up and fight the hard fight. Only for our generation, nobody is really doing so. Which is why we need it in our fiction. In The Avengers, Maria Hill at one point asks Nick Fury why the heroes would come back to save the day. And Nick Fury’s answer is poignant, relevant, and sad: “Because we’ll need them to.” That is the dream and the yearning that drives super hero narrative, and which underlies our fascination with the archetypes it exposes. Because we always need heroes. And today, in our world, it has become awfully difficult to spot them (at least among our supposed leaders). And we need heroes today, in places of great power, on local street corners, and in our schools. Because Cap and the Avengers, Supes and the JLA, are just stories. And they won’t save the day, no matter how much we may need them to. In the past month, I got to see two very different film adaptations of books that I loved: Martin Scorsese’s Hugo (which adapts Brian Selznick’s The Invention of Hugo Cabret ) and Tomas Alfredson’s Tinker, Tailor, Soldier, Spy (an adaptation of John le Carré’s novel of the same title). Although both feature science fictional elements (if you don’t believe me about Tinker Tailor Soldier Spy , then check out my earlier blog post on the subject), they could not be more different. Hugo is a children’s story, and Tinker, Tailor, Soldier, Spy is as far from middle-grade as one can get. And yet, their screen adaptations got me thinking about the nature of prose and film, and on the differences in storytelling between the two mediums. Both Selznick’s middle-grade novel and le Carré’s spy novel are excellent works of fiction, captivating and moving on multiple levels. What makes these books so good is the way in which they unfold with unity of plot, theme, and character. At its most basic level, The Invention of Hugo Cabret is the story of how a young orphan named Hugo finds a family, and how an old man named George finds himself with Hugo’s help. Le Carré’s Tinker Tailor Soldier Spy is the story of how an old retired spy is dragged back into the murky world of betrayal he had (ostensibly) left behind. Selznick and le Carré are very different storytellers. More than half of Selznick’s book is told visually through gorgeous drawings. A picture is worth a thousand words, and as a world-building device Selznick’s drawings perform beautifully: his opening sequence introduces us to 1930s Paris, to the Gare Montparnasse, to our hero Hugo, and to the old man at the train station. In a handful of drawings, Selznick quickly draws us into Hugo’s world and engages us with his two primary characters. When Selznick switches into prose, we already suspect what comes next, even if we can’t articulate it. Selznick uses his drawings to lend emotional immediacy to his story, thus accelerating the rate at which we invest in his characters. Le Carré doesn’t use illustrations. Tinker Tailor Soldier Spy is all told in prose, and deals with the very difficult themes of betrayal, loyalty, and motivation. Although the book follows George Smiley, it actually features a broad cast of characters. Le Carré’s omniscient narrator takes us in and out of their heads smoothly, giving us insight into everyone’s motivations, concerns, and emotional states. And while Tinker Tailor Soldier Spy is a spy novel, a great deal of its prose focuses on the (seemingly) banal personal relationships of Smiley, his wife, and his friends. By showing us both the intellectual game of espionage and its more private underside, le Carré earns our investment in the character: we understand the degree to which Smiley is conflicted with his charge, we understand the degree to which the chase both excites him and disappoints him, and we understand why his companions and quarries act the way they do. His personal concerns, and those of his friends and enemies, serve to establish moral equivalence, to humanize them for the reader. Both books feature multiple, related plotlines, and all of these plotlines oscillate around the same themes. The different converging plots involving Hugo, his father’s automaton, the old toyshop owner, and the Station Inspector who hunts the orphan child all swirl to greater or lesser extent around the question of family and acceptance. The same holds true for George Smiley: the A plot of Smiley’s hunt for the traitor puts into concrete action the themes of le Carré’s B and C plots (Smiley’s relationship with his deceased mentor, and Smiley’s relationship with his wife). This unity of action, theme, and emotion closes the emotional distance that would otherwise have been built between the characters and the reader. And ultimately, it is this unity that makes the stories compelling. Obviously, there are many differences between text and film. However, I like to believe that good storytelling transcends the medium and that the underlying goals of storytelling are universal: we want the audience to be engaged, we want them to be interested, we want them to turn the page. However, different techniques are employed in different media to achieve our intended narrative effects. In a real sense, authors and film-makers are master manipulators: it is our job to evoke some kind of response on the part of our audience. If we evoke the response we intended, then we’re doing a good job. If we evoke a different (or the opposite) response, then we’ve made a mistake. In prose, our primary tools are the events that we depict, the information we impart to the reader, and the language we use to do both. Of course, this is a gross over-simplification: I could probably talk about choosing a single metaphor for a day or two if given the chance. Yet nonetheless, it is our job as creators to choose what we want to present and how to present it. In prose, all of these tools are in the author’s control (although to be fair, good editors have their say, too). 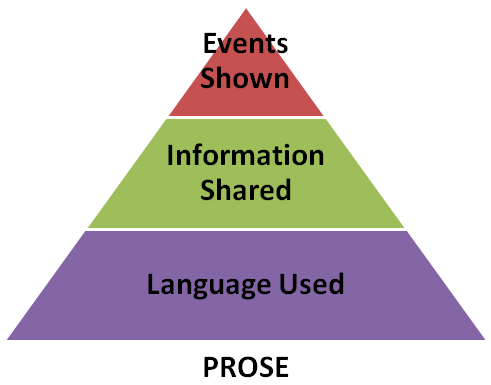 When we write, we make conscious choices as to what information our reader needs, when they need to get that information, and how that information is delivered to them. In film, it’s a little more complicated. At the most basic level, movie-makers have the same two basic tools as authors: they select the events they wish to show, and decide the information they wish to impart to their viewer. However, language is only one of the many devices they have available to accomplish both goals. Actors convey a wealth of information on multiple levels: their facial expressions, movement, and tone of voice all are part of the storytelling and are only partially (at best) under the screenwriter or director’s control. Then, directors choose what visuals are presented in the film, how shots are set up, how a scene gets lit, and how it gets staged. This is conveyed visually, but can be used to elicit an emotional or intellectual response in the audience. And the soundtrack adds an emotional undertone to the visual events, guiding the audience into a certain desired state. And finally, we get the language that is used in the dialog itself. 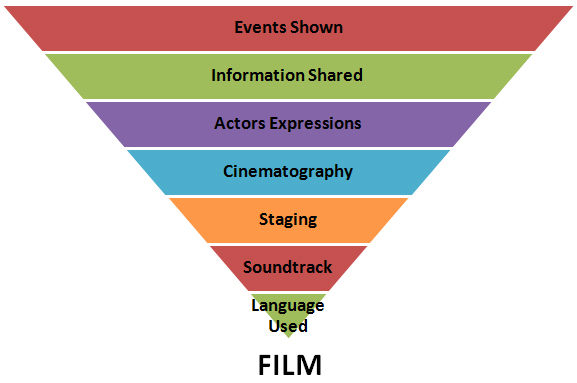 This is not to say that there are more moving parts in film-making. There aren’t, despite what movie makers might say. It’s just that the moving parts are very different from those faced in prose, and I think that when writing and directing an adaption it is incumbent upon us to bear in mind the differences in technique that both mediums work with. Martin Scorsese’s Hugo is probably one of the best film adaptations I have ever seen for the simple reason that it tells the same story that the book told, hitting the same narrative notes and evoking the same emotions in me as an audience member. While Scorsese may have chosen different events to show, different information to share with the audience, and of course made his own choices on cinematography, soundtrack, etc., his adaptation stayed true to the overarching flow of Selznick’s story. Hugo achieved the same type of unity in plot, theme, and character as The Invention of Hugo Cabret, and as the original book’s story was excellent, so too was its film adaptation. To be fair, Scorsese’s task was made easier by Selznick’s beautiful illustrations. The book was itself already heavily cinematic, with illustrations that conformed to most of the classic structures of visual storytelling: establishing shots, action shots, close-ups to communicate facts and emotions, etc. Since half of Selznick’s book consisted of detailed illustrations, much of the visual storytelling had already been done. I expect this made Scorsese’s task at least somewhat easier, since Selznick had already made a slew of decisions regarding the story’s visual narrative. Of course, this is not to suggest that Scorsese, the actors, and the screenwriter John Logan didn’t have a lot to do with the finished product. But it is very clear that they were heavily influenced (as is only right for an adaptation) by Selznick’s original book. By letting Selznick’s illustrations and storytelling influence their choices, they were able to capture his thematic and tonal focus, leading to a finished work as beautiful, compelling, and moving as the original. Unfortunately, Tomas Alfredson’s Tinker, Tailor, Soldier, Spy does not work nearly as well as Scorsese’s Hugo . It remains a good movie: the cinematography is solid, the music is excellent, the acting great, and the writing good. It clearly tried to stay true to the original source material, but by de-emphasizing the characters’ personal lives it weakened the overall product. The film version of Tinker, Tailor, Soldier, Spy engages us on an intellectual level: George Smiley (played well by Gary Oldman) and company keep the audience at an emotional distance, presumably just as they keep themselves emotionally removed from the sordid work that they do. That leaves us with the intellectual mystery of the whodunit: we are engaged with the story because we want to identify the traitor…not because we care about what happens to any of the characters. Superficially, this is consistent with the book: le Carré portrays most of his characters, and Smiley in particular, as emotionally distant. Yet le Carré shows us that their reticence to engage emotionally is a sham: by showing us their emotional reactions to their personal lives, we know the characters to be living, breathing, feeling human beings. Alfredson chose to de-emphasize this emotional dimension of the story, and his movie suffers for it. It is telling that the two characters who I found most engaging in Tinker, Tailor, Soldier, Spy were the two shown to be emotionally invested in their own stories: the naive Ricki Tarr (Tom Hardy), who tragically falls in love with a Russian agent, and Peter Guilliam (Benedict Cumberbatch), who kicks his lover out of his flat to keep him safe. It is precisely because these two characters are shown to be more than cold-blooded apparatchiks that they evoke an emotional response. We can identify with their concerns, and can feel empathy for their troubles. The emotional concerns of the other – more principal – characters are merely alluded to, and not really explored. It could be argued that those concerns are purposefully left between the lines, there for the discerning viewer to pick up and project onto the screen. That may well have been the reasoning, but I for one found the effect flawed: if that was the intent, it didn’t work for me. The movie was engaging on an intellectual level, but fell short of the unified intellectual/emotional impact evoked by the original book. It seems to me that putting together a good film adaptation of a great book relies on a careful examination of why a book worked, and then translating the techniques that worked in prose form to film. If the method by which a book worked were correctly identified, then a good filmmaker should be able to achieve similar effects using the tools available to them. Of course, this is easier said than done, especially in a Hollywood driven by consensus decision-making. What are some other examples of good adaptations? Why did they work? Or how about some terrible adaptations, and why did they fall apart? Love to have some more perspectives!